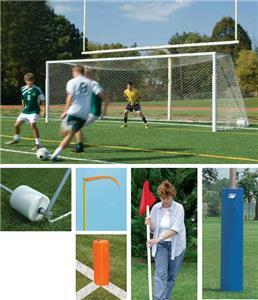 Bison High School Complete Football & Soccer Combination Goal Packages. Make your buying decision easy and save money, too...Buy your football goal posts and soccer goals in guaranteed compatible packages. Bison H.S. Football & Soccer Combo Goal Pkg. This product qualifies for FREE SHIPPING. Click for More Info. This product can only be shipped within the US. Make your buying decision easy and save money, too...Buy your football goal posts and soccer goals in guaranteed compatible packages. Sold As Complete Package. This is the perfect solution for new schools and renovated fields. NOTE: Packages will not allow soccer play on 120 yard soccer fields.